Everything's big in Canada, eh? The newly opened Harvie Passage Whitewater Park. 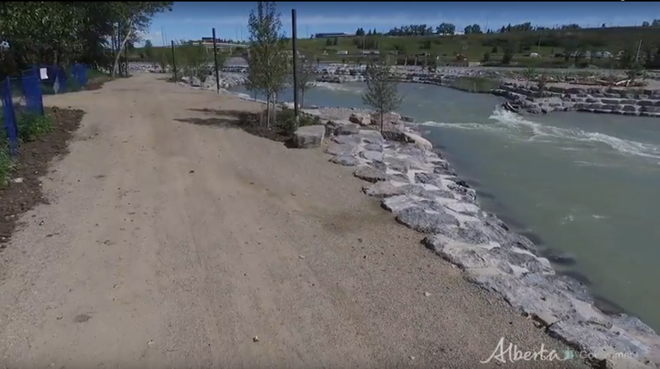 Whitewater park design firm Recreation Engineering & Planning has big news: Five years after being destroyed by a devastating flood, Calgary’s Harvie Passage river park has officially reopened. Everything’s big in Canada, eh? The newly opened Harvie Passage Whitewater Park. The passage, which has been closed since the June 2013 flood, has been completely redesigned from river to shore. This design is more resilient and has been designed to withstand volumes of water similar to the those that damaged the previous passage structures. A number of features have been incorporated in the redesign to make the passage safer and provide a more enjoyable experience for river-based recreationists. The new Harvie Passage was originally open for eight months before being wiped out in the 2013 flood. But the disaster did make it possible for the engineers and construction people to build a longer, better course. 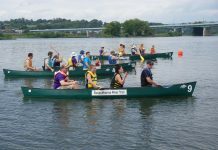 The $8-million, five-year long redesign essentially turns the river passage into two very different degrees of difficulty, so paddlers of all skill levels can navigate it. “The river left channel, closest to Deerfoot Trail, has the majority of the volume of the river going through it. It has some really fun — but very large — waves. “The river right side has a smaller portion of the river going through it. 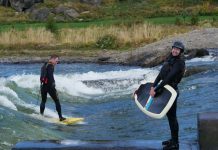 It’s designed to be a safe passage that almost anybody can float down, but [also contains] enough bends turns and waves to keep the splash up and keep it really fun,” Taylor said. There are two passages for river users. The Eastern (river left) passage is considered a Class III passage. The Western (river right) passage is a Class II passage, with slower moving water. 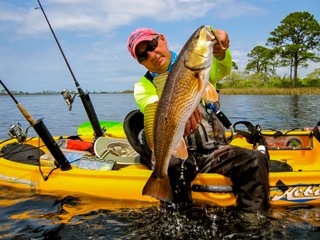 Less-experienced boaters can also exit the river before the passage and portage the major water features. Additional benefits of the project include the new shoreline spaces for bystanders, as well as tree-lined walkways and beach areas for the public complementing nearby Pearce Estate Park.